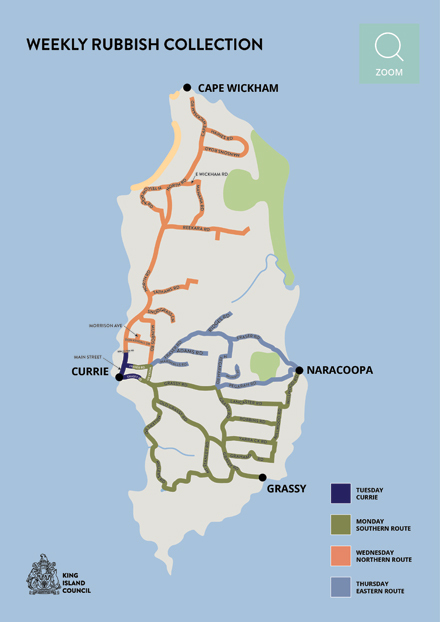 A weekly residential rubbish collection operates throughout the whole Island. Details of collection times can be viewed on the downloadable map above. Please leave your bin out before 7:30am on your collection day. Household rubbish can be deposited in 240 litre mobile garbage bins. The total weight must be less than 65 kg including the bin, and only household refuse may be left for collection. Please wrap all materials likely to be offensive or to spread (e.g. vacuum dust) prior to being placed in the rubbish bin. We encourage you to compost food waste as this means less landfill and it is also great for your garden. If however rubbish disposal is required of food, please also contain appropriately. Please place bins in such a location that it will not present undue hazard to pedestrians. Please make sure the bin is placed with handles facing away from the road. Additional and/or replacement bins are available from the Council. Please see below relevant fees. For more information contact the Council Depot. King Island residents can safely dispose of domestic quantities of household hazardous waste at the King Island Waste Transfer Station. Contact the Council Depot for more information on disposal of hazardous waste. Please see relevant fees and charges for disposing waste at the Tip below. Asbestos may be delivered by prior arrangement only. Read more here Asbestos Information. Chemical containers may be delivered to the Waste Transfer Station for inspection and acceptance in the drumMUSTER program. Read more about the drumMUSTER program here. Treated timber needs to be declared on arrival. ‘Treated timber’ means timber that has been treated in a pressure vessel with copper, chromium and/or arsenic solutions. Tyre discounts are available if tyres are cut ‘radially’ which means to cut along the circumference of the tyre. Fluids must be removed from motor vehicle bodies prior to disposal. Refrigerators and Air Conditioners must be degassed with supporting certification. Commercial rubbish collection services are available three times per week. Commercial waste can be placed in 120 litre, 240 litre or 660 litre bins. To arrange a commercial collection service, find out about commercial waste collection days or request an additional/replacement bin, please contact the Council Depot. King Island Council is actively aiming for a more sustainable solution to waste management. Council is currently undertaking a waste management review that will look at better recycling arrangements for the Island to establish an efficient, effective recycling system that benefits the Island, its users and Council as the regulator and service provider. Council separates green matter and offers battery and aluminium can recycling stations, which are managed by the local Lions Club. The King Island Lions Club has been collecting batteries, aluminium cans and electrical cords for a number of years. Funds raised by the Lions Club from recycling these items are spent on community facilities. Aluminium cans and electrical cords (any power cord or plastic-coated computer cable) can be placed in the large cages at both Parers Hotel car park and at the back of the King Island Club as well as in the red collection bins that are at the Golf Club, Currie Harbour, Ellie’s Cafe, Currie football ground, 13 Lighthouse Street and 7 John Street. To recycle batteries, you can either take them to the Waste Management Depot or contact Lion member Ira Cook on 0417 615 598. It is preferable that batteries are drained, however the Lions Club are happy to collect them as is. They are also willing to take any scrap metal. The King Island Lions Club also recycle used postage stamps. The collection box is at the Currie Post Office. Funds raised go towards buying walking frames for disabled children through the Children’s Mobility Foundation. Used spectacles (frames and glasses, not the cases) can also be recycled. The collection point is at the local Chemist. These spectacles go towards vision and sight campaigns worldwide. Clothing can be recycled by either placing in a charity bin located behind the Currie Library or by donating to the Senior Citizens Opportunity shop. For more tips on how to minimise your household waste and to help keep King Island beautiful, you can find out more here.